You start by removing the grill. 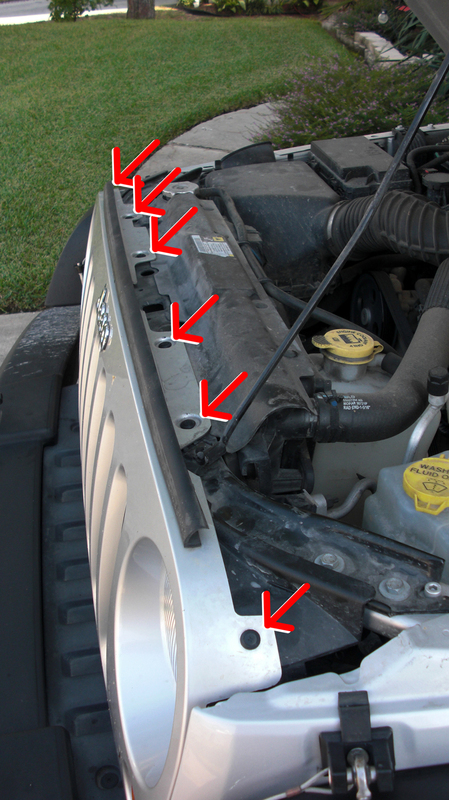 There are six plastic retainers that hold the top of the grill to the upper radiator support. Next you're going to disconnect the turn signals. Easiest way is to just remove the bulb from the housing. Turn each bulb towards the ground (looking down, counter clockwise for the driver's side, clockwise for the passenger side) and let it hang. 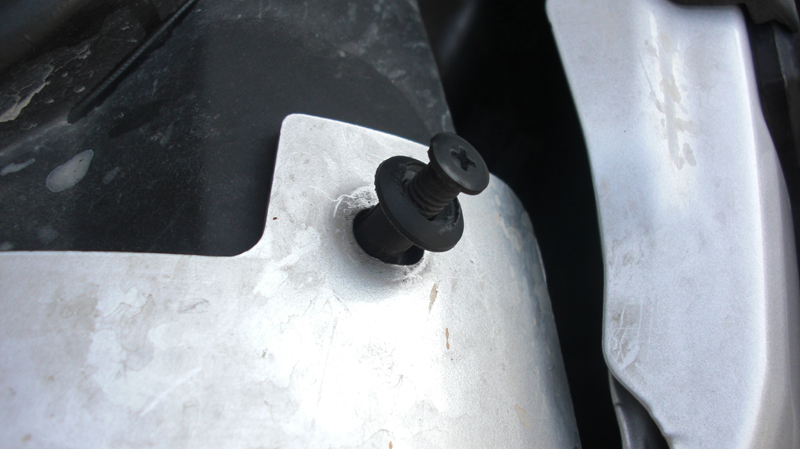 Each headlight is retained by a metal ring, and there are four T15 Torx screws holding on the retaining ring, remove the four screws. In the next millennium, I'll still be Old School. Take your new IPF housing and install the bulb. Be sure to not touch the bulb, as the oils on your fingers will affect the life of the bulb. If you accidentally touch the bulb, clean it with a little rubbing alcohol. 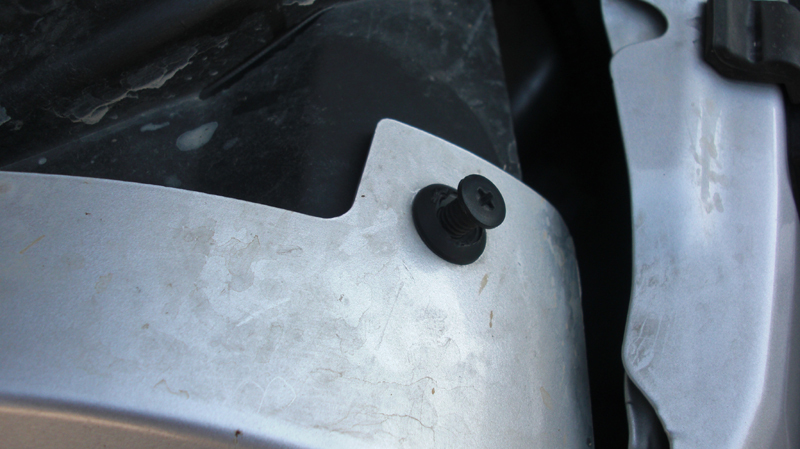 Remove the retaining ring from the factory headlight housing and install it on the IPF housing. Install note: The retaining ring fits very snug on the factory housing, but fairly loose on the IPF housing. You might want to wait until you're actually ready to screw down the retaining ring to put it in place on the housing. Next, put a little dielectric grease on the contacts of the bulb, and take the square end of the adapter harness and plug it into the bulb. Install note: I did not like the fact that there is no positive retention of the harness onto the bulb. 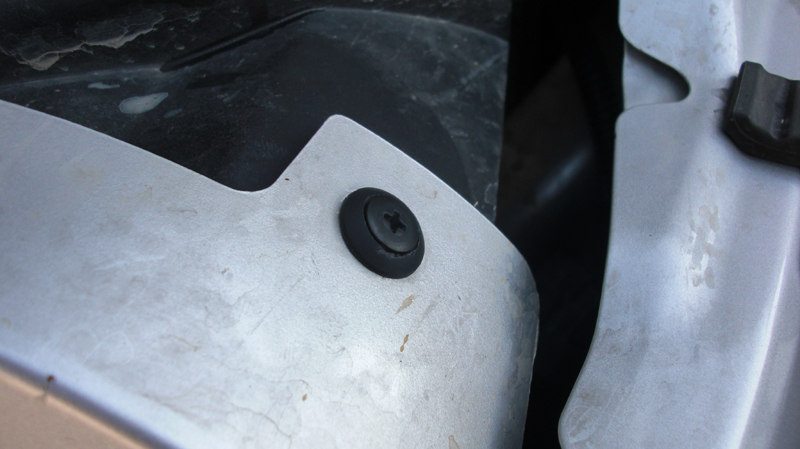 The fit was loose enough that I felt with enough vibration, it would eventually work itself loose. In order to prevent this, I slightly tweaked one of the parallel contacts on the bulb. This created enough friction in the connection to keep it tight. Install note: The fitment of the IPF housing into the factory location is very poor. Where the factory housing fit nice and tight and it was very clear how it was supposed to be oriented, the IPF housing was loose and just never seemed to fit quite right, no matter how I tried to fit it in there. Once you've fit the housing in place, and the retaining ring over the housing, screw in the four Torx screws. And you're done with the driver's side. The passenger side is the same process as the driver's side, the only real difference is that it's easiest to route the extra wiring of the adapter harness towards the passenger fender. Now you have the new lights installed. Check all your lights now, before you reinstall the grill. Installing the grill is just the reverse of removing it. First, set the grill into place and line up the metal retaining tabs at the bottom of the grill with the slots in the radiator support. Next, reinstall your turn signal bulbs. Then press on the grill where the retaining tabs are in order to snap the lower half of the grill in to place. The grill should be pretty much in place by this point, push it rearward until the holes line up. Reinstall the six plastic retainers at the top of the grill. Last edited by SoCo_Fox; 10-10-2012 at 07:40 PM. You now have your new IPF H4 headlights. I found the look of these headlights to be rather retro. They look more like an old-school sealed beam headlight than a fancy pants upgrade. These headlights don't announce themselves as an aftermarket light. The color of the light produced by the IPF H4 headlights is closer to the color of natural light, and that makes it look slightly more blue in comparison to the factory headlights. The light color is on the factory headlights is yellowish, and the pattern is apparent on this close-range picture. The light is produced in a solid "bar" through the whole width. The IPF lights have a more natural blue tone to the light, and the E-Code pattern is more sharply defined. Notice the kick up on the right side of the light pattern. Install note: These headlights did not carry a DOT stamp (that I could find). They are, however, E-Code stamped, which is the designation for a European standard headlight. The pattern of an E-Code is generally understood to be sharper with a more defined upper cutoff than a typical DOT headlight. If you live in a state that has very strict vehicle inspections, they might give you trouble if they can't find a DOT stamp. This is just something to think about. Aiming the headlights is a fairly straight forward process, and there are good resources on JKO as to the process. The IPF headlights had to be aimed a good bit higher to get what I felt was good coverage. I have not had anybody flash their brights at me thus far. Notice how the factory pattern doesn't even show up on the ground until quite a distance from the front of the Jeep. The IPF lights, by comparison, put more light closer to the front of the Jeep. Initially, I found the light being closer to the front of the Jeep to be more distracting than the factory lights, especially with the brighter output. The factory lights put more light off to the sides of the road than the IPF H4's. The IPF lights have a pattern that is "straight ahead" compared to the factory lights. I found the IPF lights to be lacking in tight turns on dark roads, there wasn't enough light cast to the sides to illuminate the road. I particularly noticed this in neighborhoods with 90-degree turns in the road. One can tell by the stop sign in the distance that the more natural light color combined with the pattern of the lights sets off reflective surfaces far better than the factory lights. This was one thing about the IPF lights that I particularly liked. Initially, I was not very impressed with these lights. The lights had a far better color and brightness than the factory lights. However, the light being cast so close to the front of the Jeep was very distracting to me. I don't normally drive with the fog lights on, so those who do might not have a problem with this pattern. I didn't like it. It seemed like I had to keep aiming the IPF lights higher and higher just to get them to put any meaningful light down the road where I felt it would be useful. I drove this Jeep and another Jeep (with stock headlights) back to back, and I felt like I preferred the stock lights. It was hard to believe that was the case. It took me about seven days of driving with these headlights before I started to come around to the IPF lights. I was driving down a two-lane blacktop with no street lights, and I realized that I was actually seeing the road quite well. These headlights seem to be better suited to highway driving. The beam projects dead-straight, with little to the sides. Road signs and lane markers are far easier to see and read from greater distances than the factory lights. The high-beams are aircraft landing-light bright. I grown to like the sharp cutoff of the E-Code beams, and the limited light being cast to the side of the road doesn't seem as bad as I originally thought. My main concerns with these headlights were mostly with fitment. The housings did not fit into the Jeep particularly well, and the bulb-end of the adapter harness did not inspire confidence. The look of the lights is old-school, and I haven't really decided if I like it or not. The pattern of the lights really boils down to a matter of preference. Overall, I was not blown away by these lights. I can't really be sure if I'm seeing the road any better, or if I've just grown used to them. There was not that "wow" factor one would hope for with an upgrade to better lighting. Last edited by SoCo_Fox; 10-11-2012 at 09:15 AM. good write up! I plan on doing the rally lights full harness upgrade with the Hella replacement lamps. Good write-up. I have the IPF's as well (in the bluer "white" color) and had issues with the pigtail wiring coming loose. I'd disconnect and reconnect them again and again, and they'd work for a day or so until they wiggled loose again. Got tired of that and just ended up cutting the connector piece out of the equation and "hardwiring" them in place. They've worked since then without fail. And I agree with your opinion on them. Not earth-shatteringly great, but still - better than the stockers and decent enough upgrade for the price. I'd love to have a set of Trucklite's, but wasn't about to shell out the cash for those. I replaced my factory headlights, but went with the Cibie housings and the full conversion harness. LOVE the change. A small zip tie works for the loose connection points. I noticed a big enough difference on my Jeep between the stock lights and the IPFs to recommend them. I put some clear silicon around the mounting ring to snug them up and they fit great after that, no wiggling around or anything. I never had an issue with my harnesses. I have only had this happen in one car when I had fitted 90/110W globes instead of the standard 55/60W ones. When you die, you see your life going by in a flash. Steve Jobs didn't - Apple doesn't support Flash. This message has been reviewed & approved by the NSA, Google and Microsoft. I know a lot of folks aren't a fan of the new H13 bulbs that the stock housings use, particularly the connectors. When I get around to it, I have a pair of Hella H4 E-code housings I want to install and I'm probably going to just cut off and replace the H13 connectors instead of pigtail them. I just hope I remembered to pack those H4's when I moved, and didn't leave them behind. I didn't realize it was that much to replace the lamp housings, and really appreciate the write-up. It looks like more work than it really is. It's about 20 minutes of work if you're not taking pictures like I was.